As one approaches the Legislative Building of Manitoba from the west he becomes aware of two statues flanking the entrance. That on the left is the figure of Major-General James Wolfe, the victor at Quebec in 1759, that on the right is the seated figure of the Marquess of Dufferin, Governor-General of Canada from 1872 to 1878. He is shown in his robes of State as if presiding at the opening of Parliament at Ottawa as the representative of the reigning Queen. How is it that among the successive Governors-General of Canada Lord Dufferin should be the one so honored? The reason is the deep affection in the hearts of the citizens of Manitoba felt for the first Governor-General to visit the province. In 1877 he visited not only its capital but the settlements of Mennonites and Icelanders who had made their homes in Manitoba only a few years earlier. He and his Countess were singularly able and charming people. 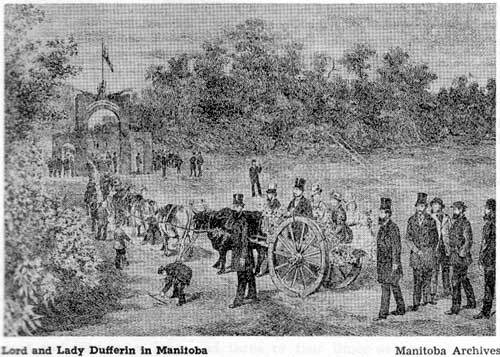 Their names are commemorated in many places and ways; at Quebec by Dufferin Terrace; in Manitoba by the County and Municipality of Dufferin; by Fort Dufferin near Emerson from which the first force of the North West Mounted Police in 1874 marched out to establish law in the Canadian West; in Winnipeg by Dufferin Street, Dufferin School, and “The Countess of Dufferin”; in British Columbia by the Dufferin coach, the stage coach in which they travelled to Barkerville in the Cariboo. Their ancestral home, Clandeboye, is recalled in the district of Clandeboye, Manitoba whose first settlers, the Muckle family, came from the Dufferin estate in Northern Ireland. The first name of our present Premier derives from Dufferin municipality. Lord Dufferin, educated at Eton and Oxford, began, in 1858, a career in diplomacy his first assignments being in Egypt and Syria. In 1862, he married Harriot Hamilton, daughter of Archibald Rowan Hamilton of Killyleagh Castle, County Down, Ireland who accompanied him on his various diplomatic missions. In 1872, Dufferin was appointed Governor-General of Canada. With Lady Dufferin and their three younger children he arrived at Quebec where he stayed for a time in the citadel. They proceeded to Ottawa, which had been selected only a short time before by Queen Victoria as the capital of the Dominion, and made their home at Rideau Hall. In Canada the game of politics was fought keenly, even bitterly, particularly so during Lord Dufferin’s tenure of office. In one of his speeches the Governor-General likened himself to the engineer of a vast and complicated machine who moves about with his oil can keeping the wheels of government moving. Manitoba figured in one of his embarrassing moments. In 1874, Ambroise Lepine, Louis Riel’s adjutant, was convicted of the murder of Thomas Scott and sentenced to hang. Scott had been a member of the Orange Order and his father was a tenant on the Dufferin estate. In Ontario the Orangemen clamored for Lepine’s execution; in Quebec the ties of blood were strong and the people believed that he should have been protected by an amnesty. Lord Dufferin reported the situation to Lord Carnarvon, Minister of Colonial Affairs in London, suggesting a commutation of the sentence. Lord Carnarvon cabled that the Governor-General, after conferring with his Ministers, might reduce it to two years imprisonment with forfeiture of civil rights. Lord Dufferin misread the abbreviated cablegram and announced the commutation on his own initiative. He was sharply criticised as having acted unconstitutionally but the storm blew over when Lord Carnarvon officially rapped him over the knuckles for acting without consulting his Ministers. At the end of July 1877, Lord and Lady Dufferin left Ottawa for Manitoba. They travelled by railway to Fisher’s Landing, Minnesota, where they embarked on the sternwheeler Minnesota. The party arrived at Fort Garry on 6 August and met Lieutenant-Governor Alexander Morris. Then passing under three arches, one near Fort Garry, a second at Main and Portage Avenues, the third at the Court House near Main and William, the procession arrived at the City Hall. The Mayor of Winnipeg read an address of welcome to which the Governor-General replied. After inspecting the guard of honour, Dufferin and the vice-regal party proceeded to Silver Heights, the summer residence of the Lieutenant-Governor. Donald A. Smith, Chief Commissioner of the Hudson’s Bay Company in Canada and owner of the property, met them and escorted Lord and Lady Dufferin to the cottage which had been prepared for them. The next day’s programme called for a journey to the Penitentiary at Stony Mountain which rises 80 feet above the plain. About half a mile from the Penitentiary the carriages came to a halt and the Governor-General was invited to mount another vehicle. This was a Red River cart drawn by 80 oxen. The driver of each yoke of oxen wore a hat gaily bedecked with ribbons. Impressed with this novel conveyance, Lady Dufferin and her daughter Helen, insisted on riding in it. In her Journal Lady Dufferin remarks, “We passed through a beautiful triumphal arch, made of grain, with a spinning-wheel, plough, and other agricultural implements on it ... A very handsome arch had been put up about a hundred yards from it, and fifty yards nearer to the house was another: these two were connected with chains of green rope, hung from poles with flags on them ...” Riding in their cart the party was brought to the gate of the prison where they were greeted by the Warden, Samuel Bedson, and his wife. The remark made by Lady Dufferin on the institution was that its operation was expensive as there were fourteen officials and fourteen prisoners. Next morning they visited St. Andrew’s Church on the Red River. 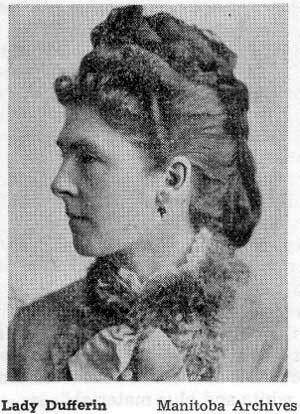 There Lady Dufferin was presented with a bouquet by a young lady who made a long speech in Cree, “trembling violently”. They passed on to the Stone or Lower Fort which Helen Dufferin explored thoroughly. Selkirk on 17 August was the next stop on the itinerary. Here another large arch surmounted by railway implements had been erected. The same day Lord and Lady Dufferin drove on to the Indian reserve past Selkirk to be greeted by a chief “in a fine red coat, and with two enormous medals on his breast”. The chief was Henry Prince, son of Peguis who had befriended the Selkirk settlers. Escorted by William Hespeler, the Mennonite agent who acted as guide and interpreter the party travelled to the recently organized Mennonite community near the present town of Winkler. The Mennonites were most desirable immigrants, Lord Dufferin wrote, “hard-working, honest, sober, simple, hardy people.” Everything looked very neat; homemade furniture, flowers in the windows, nice gardens. Driving through the prosperous looking villages the party was greeted by a group of 700 Mennonites standing on the prairies with specimens of their farm and garden produce. The party proceeded west to a camping ground where the men with James McKay, a member of the Provincial Legislature, as guide went out shooting. Around the camp fire in the evening McKay told them stories of his adventure-filled life. One story that amazed Lady Dufferin was his account of having killed a bear with a lasso. Having no gun with him he threw a lasso over its head, turned his horse away quickly, pulled the bear over on its back and strangled it. At the end of September, the vice-regal party bade farewell to Manitoba travelling up the Red River on the S. S. Minnesota. At Grand Forks they saw the engine of the Canadian Pacific Railway which was to be the first railway locomotive on the prairies and were informed it was to be called the Lady Dufferin. The visit to Manitoba was the first to be made to the Province by a Governor-General. It was a memorable one for the Province and for Lord and Lady Dufferin. As they had boarded the Minnesota there was “much firing and shouting and waving of Adieux”. The Life of the Marquess of Dufferin and Ava: Sir Alfred Lyall, Thomas Nelson & Sons, London, Edinburgh, Dublin, N.Y.
My Canadian Journal: Marchioness of Dufferin and Ava, London, John Murray, 1891. Manitoba Free Press, 6 August, 1 October 1877.